So, you have landed an interview for a seemingly wonderful job! Now what? To lock in a job offer, you'll need to impress your interviewers. Having the right interview skills will help you get hired. Here are some tips and strategies for effective interviewing from preparation through delivery. Gathering background information on a prospective employer is crucial to successfully preparing for an interview. Your first step is to review the employer's website, especially the About Us section. Take a look at the company's social media presence, too. This will give you insight into how the company wants the public to perceive it. Research the company's history, its position in the market, and new developments, particularly recent or planned changes that could affect your role. Don't be afraid to request additional details about the position at hand, too. When you demonstrate your knowledge about the organization during an interview, it shows genuine interest, which is what interviewers want to see. The insights discovered in your research can also help you calibrate your responses to questions. If you believe your qualifications and the job requirements are the perfect match, don't be shy about envisioning yourself in that role. When asked, be prepared to comment on what you can accomplish in your first 60 or 90 days on the job; however, don't come across as a know-it-all whose mission is all about change. Prepare answers to commonly asked interview questions. Doing so will help you analyze your background and qualifications for the position. Plus, thinking through your responses will help you sound confident during the interview, and avoid rambling or incoherent responses. You should also be ready for behavioral interview questions, which many of today's recruiters have adopted as a preferred method of screening candidates. 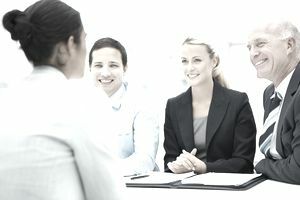 Learn how to prepare for this common interviewing approach by reviewing behavioral based interviewing. Very commonly, interviewers will ask if you have any questions for them so plan ahead, and have a list of questions ready to ask. Get even more tips to ace the interview, so you're sure you've covered all the basics. Visit our Salary Center for salary survey information in a broad array of fields. This data will provide you with the information you need to discuss salary offers. You'll also find tips for successful handling those salary negotiations. Consider questions about your salary requirements a good sign. Employers typically don't broach the subject unless they're contemplating you coming aboard. On the other hand, premature questions about salary are sometimes used to weed out candidates. For example, if the job application instructions require you to include salary history and specific salary requirements, that can be a tactic to classify applicants as "qualified with feasible salary requirements," and "qualified with high salary demands." But if the interviewer wraps up your meeting with questions about your salary requirements, it could be a sign that your skills and qualifications are impressive enough to move you to the next stage in the selection process. Mistakes happen. Sometimes, a question will stump you. Or an unexpected situation will make you late. Many of the most common interview mistakes can be avoided with a bit of planning -- and some awareness of interviewer pet peeves. Take a look at the most common interview mistakes, along with tips for how to avoid making them. Ask a close friend or mentor to conduct a mock interview with you -- someone with insight about recruiting and hiring processes is ideal! Record the mock interview and review it to see how well you answer questions. As well as paying attention to your responses during this practice run, take a look at your posture and eye contact. Your body language during an interview - from the initial handshake when you're greeted through your farewell at the end - can make a difference in how interviewers perceive you. Try on your interview attire - make sure it fits and that you feel comfortable. Don't wait until the last minute to get directions to the interview location and estimate your travel time. Give yourself enough time to arrive several minutes early so you have time to decompress and relax before your meeting. Before you go into the interview, make sure your phone is turned off or is on silent. The last thing you need is your phone going off in the middle of a job interview! Taking the time to prepare will help you avoid job interview stress, and will set you up for interview success.